So, you’ve revised, worried, and revised again, and now the day is here: it’s time for your exam. 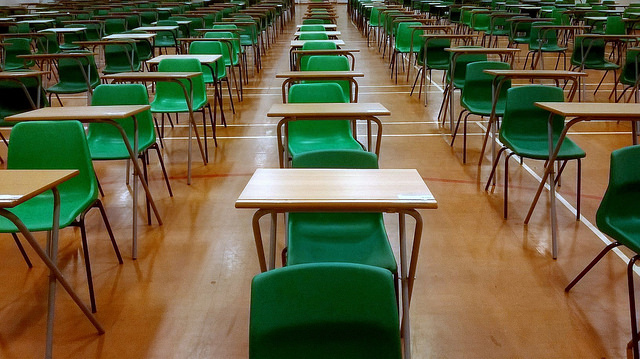 From a seasoned exam-taker, here are some top tips on how to handle the exam hall. Taking the right tools into the exam with you is crucial. It may seem obvious, but plan your stationery, check your calculator works, and, of course, take at least three pens. If a pen is going to run out, it will run out when you need it most. Also remember anything else your institution asks for: exam timetables, student cards, candidate numbers… Check what you need. Take a bottle of water. Most exams won’t let you have the label on the bottle, so take that off beforehand. A recent study has shown that driving dehydrated can be as dangerous as drink driving, and the same goes for exams: you need water to keep your brain working properly, especially in stuffy exam halls in the summer months. Yes, it might make you need a loo break, but three minutes away from your desk is worth it to keep your brain functioning when you need it most. You flip open your exam paper. Use these first few moments well. If you’ve been really struggling to remember a mathematical formula, why not scribble it down on the inside cover straight away, rather than waiting until you need it and risking forgetting it? For subjects with a choice of questions, make sure you read through all the questions, at least twice. Narrow down your options, and make some notes of your initial ideas to help you decide, and to bounce off when you’re planning. Please plan your essays. It doesn’t have to be perfect, organised or even well-developed. But in the environment of the exam hall, the chances of forgetting what your ideas were once you’re halfway through an essay are high. When you’re writing coursework, you can rearrange your paragraphs as much as you like. In the exam, you can’t, so make sure you’ve got your structure sorted before you start writing. Also, should you run out of time, at least your examiner will be able to see where you were heading! Don’t obsess over it, but make sure that you check the clock regularly. Don’t accidentally leave yourself with 15 minutes to write an essay because you got carried away on the first one. If you think you’re taking too long over a question, you probably are. Would it be better to move on, and come back to the tricky one later? Most importantly, don’t panic. Exams can be stressful, but remember that there are thousands of others going through the same thing: it is possible. If you can feel the panic beginning to rise, take a loo break, and breathe. Good luck! Do you have any tips for exam panickers once they’re in the exam hall? Let us know below! English Literature at Exeter. Online Features Editor, Exeposé. Enjoys a decent mojito, and plays netball, badly. Also a little obsessed with Virginia Woolf.